Affects, affectivity and affective labour have been widely discussed in recent years, with some scholars referring to this emergent theoretical work as an ‘affective turn’ (Massumi, 2002; Clough and Halley, 2007; Thrift, 2008). Against this background, Migration, Domestic Work and Affect offers a theoretically dense yet ethnographically informed and certainly timely, cultural analysis of affect, migrant domestic work and value in the global economy. For this purpose, Gutiérrez-Rodríguez draws on research with largely undocumented, female Latin American domestic workers in Spain, the United Kingdom, Germany and Austria. Instead of providing a monograph on Latin American domestic workers and/or their Western European employers, she analyses the processes that make the workers into interpretative subjects, as the feminized, racialized and – as ‘undocumented migrants’ (rather inelegantly in quotation marks throughout the book) – othered bodies of Western Europe. Proposing a methodology of transcultural translation and a decolonial approach to the analysis of value, Gutiérrez-Rodríguez's book is a politically acute and engaged undertaking. Among the recent, growing literature on migrant domestic work (and workers), it stands out as an analysis of the value of migrant domestic work itself, hereby revitalizing earlier feminist debates and campaigns (‘wages for housework’). Positioning herself as the child of Spanish guest workers to Germany, Gutiérrez-Rodríguez describes Latin American migrant women – alongside those from Eastern Europe and Africa – as a new generation of domestic workers in Western Europe after the end of the guest worker regime and the decline of the Fordist housewife model. In each of the four countries where research took place, the exclusion from citizenship rights and the lack of regularization policies turn domestic work into ‘almost a destiny for people, in particular women, from former European colonies trying to find a living in Europe’ (p. 87). In the context of Western Europe's restrictive migration regime and its ongoing hegemony, the performance of domestic work by Latin American undocumented migrant women, according to Gutiérrez-Rodríguez, signifies an ongoing ‘coloniality of labour’ (Anibal Quijano), which intersects with a feminization of labour. In the process, households that employ a migrant domestic worker become prime sites of governmentality and mark zones of contact that are ‘textualized’ – to speak with Gutiérrez-Rodríguez following Gayatri Spivak – by the cultural codification of commodified social relations. Drawing from interviews not only with domestic workers, but also with employers, these encounters are analysed in detail. Whereas studies on live-in care work have found employers to commonly use the phrase ‘she's like a member of the family’ in reference to the domestic worker, the mostly female, liberal and urban middle-class employers that appear in Gutiérrez-Rodríguez's book describe their employees as ‘friends’, belittling conflicts or attributing these to problems of intercultural communication. With the exception of a Viennese female employer who is quoted racializing her Ecuadorian indigenous domestic worker as ‘Asian, level-headed, quiet, modest’, and naturalizing her employment as a domestic worker by referring to ‘those people's genes’ (p. 119), Gutiérrez-Rodríguez notes that most employers took care to portray themselves as anti-racist and politically correct. Domestic workers, in contrast, emphasized the exploitative conditions implied in domestic work and were found to consider (female) solidarity with employers a farce. It is in describing the affective value and sensorial corporeality of domestic work that Gutiérrez-Rodríguez's book is especially impressive. For her, affects are bodily reactions and sensations – following Michael Hardt's reading of Spinoza's ‘energies’ – implicated in power relations. Although domestic work is perceived as non-productive labour, it creates value, Gutiérrez-Rodríguez argues, which is attached to its affective potential: affective value. Accordingly, for the women who employ a domestic worker, the employment means more than liberation from socially devalued work (making it clear that in Western European, middle-class households little has changed in the gendered division of work) – for them, it creates well-being and even happiness. Domestic workers are likewise affected by the performance of domestic work, although in different ways. Rather apodictically, Gutiérrez-Rodríguez states that ‘[t]here are no moments of happiness or joy related to domestic work in the accounts of the domestic workers’ (p. 146). The encounter with their employers and their objects leaves ‘imprints’ on their bodies and minds, and in relationships of power asymmetries, this triggers sensations of disgust, anger or even madness. 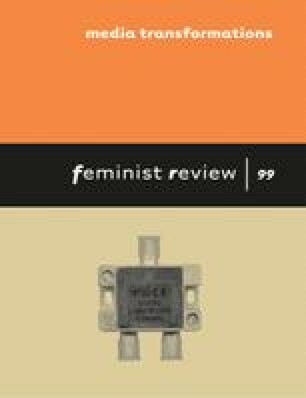 In a global economy marked by capital accumulation and increasing inequalities, this book makes clear, the escape to the metaphorical ‘gated community’ is in vain: the need to employ a domestic worker, so Gutiérrez-Rodríguez, ‘brings the inequalities into the midst of affluent households in Europe’ (p. 147). Consequently, Migration, Domestic Work and Affect ends with the call to create a language for a decolonial politics of liberation and an ethics of care. It pays tribute to a number of European movements and networks, some of which have been significantly shaped by Latin American domestic workers, including RESPECT in Berlin, Kalayaan in the United Kingdom, MAIZ in Austria, Sedouac in Spain or Mujeres Sin Rostro. By struggling for both, long overdue rights and, more fundamentally, for the right to a dignified life, for Gutiérrez-Rodríguez these activists and their campaigns seem to embody the potential of affective value to create an alternative to the logic of capital.